We have arrived in Budapest on an overnight train from Sighişoara, Romania. This is part of the Athens to Paris by Train series, start at the beginning to get the background and the details so far. 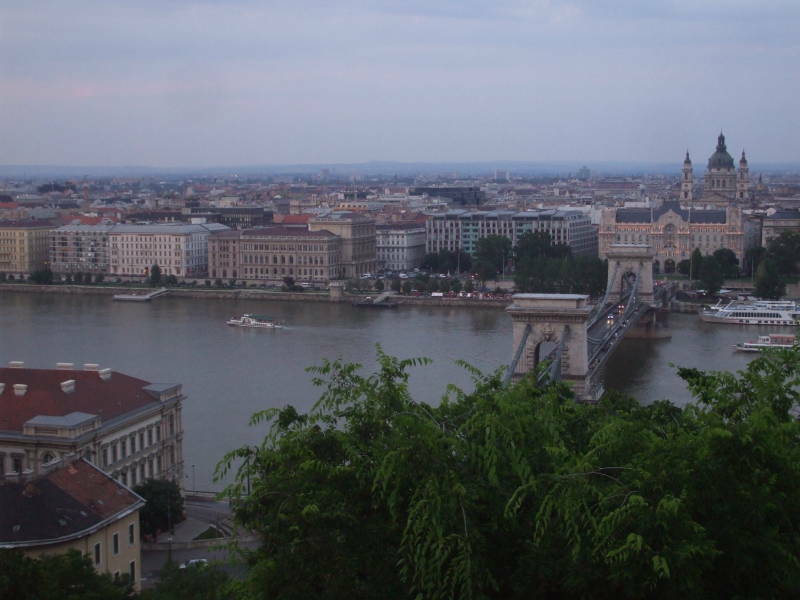 Budapest, which the locals pronounce as an English speaker would pronounce Budapesht, dates back to a settlement of the Eravisci, a Celtic tribe. The Romans took it over as a military base around AD 41-54, and had stationed a legion of 6000 men here by AD 89. The Romans called the city Aquincum. It had grown to 30,000 to 40,000 inhabitants by the end of the 2nd century AD. Atilla the Hun built a city here in the 5th century. The Hungarian people or the Magyars arrived from their homeland near the Ural Mountains in the 9th century. Their leader Árpád settled in the "Town of Atilla" in 896. The Mongols invaded in 1241, pillaging the city and killing half of the Hungarian population. Then Ögedei Khan, the third son of Genghis Khan and the second Great Khan of the Mongol Empire, died on the 11th of December in 1241. All of the "Princes of the Blood" of the Mongols returned to Mongolia to elect the new Khan, leaving the surviving Magyars to rebuild. King Bela IV ordered the construction of reinforced stone city walls and built his own royal palace on the top of the hill. 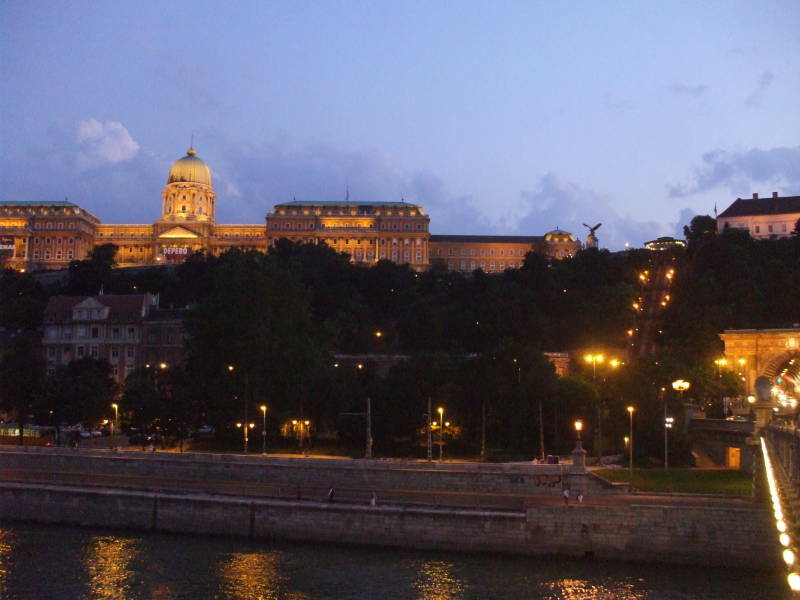 It was a pair of cities, Buda with Castle Hill overlooking the Danube River from its west bank and low-lying Pest on the east bank. 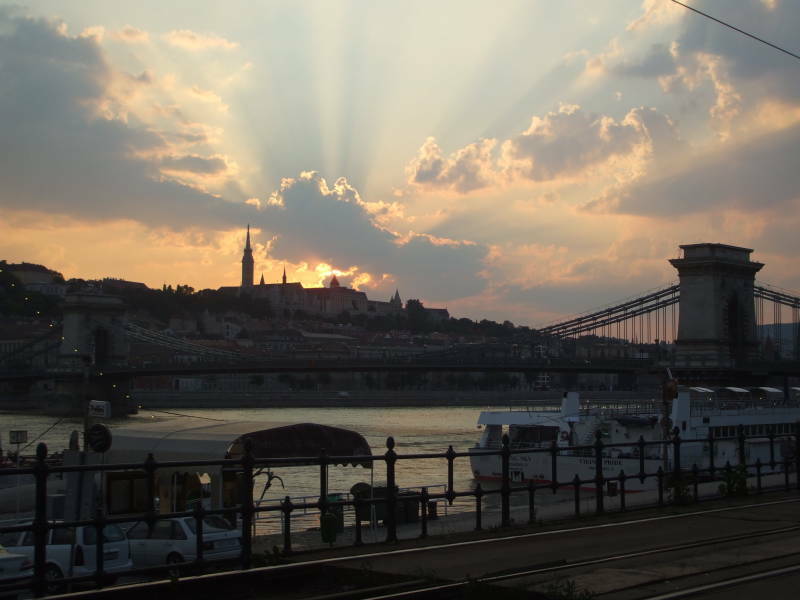 The two were first referred to as "Buda-Pest" in 1831, and united as a single city in 1873. So it was just Buda that was the Hungarian capital from 1361. How to remember which is which? 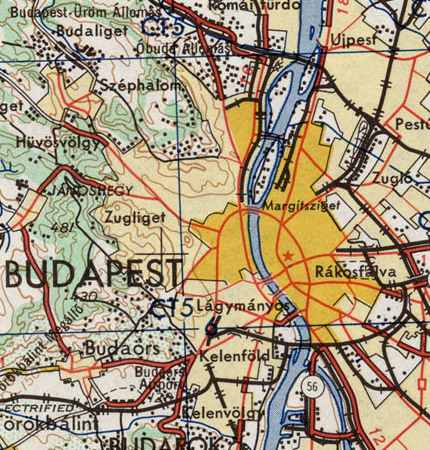 With north at the top, a map reads "Buda-Pest" from left to right (west to east). The Ottomans besieged Buda in 1529 and finally captured it in 1541, occupying the city for more than 140 years. The rest of western Hungary became part of the Habsburg Empire, based in Vienna. Starting in 1686 the army of the Holy League, an alliance of the Holy Roman Empire, the Venetian Republic, Russia and the Polish-Lithuanian Commonwealth, managed to capture all of the former Hungarian lands from the Turks. As an American military officer was quoted some 282 years later regarding the Vietnamese village of Bến Tre, "It became necessary to destroy the town in order to save it." Buda and Pest had both been reduced to rubble. A few hundred German settlers were shipped in over the next decade. It was only in 1718 that the entire former Kingdom of Hungary was recovered from Ottoman rule and absorbed into the Habsburg Empire. The Austro-Hungarian Empire was formed as a union of the royal crowns of the Austrian Empire and the Kingdom of Hungary in 1867. The House of Habsburg agreed to share power with the Hungarian rulers. 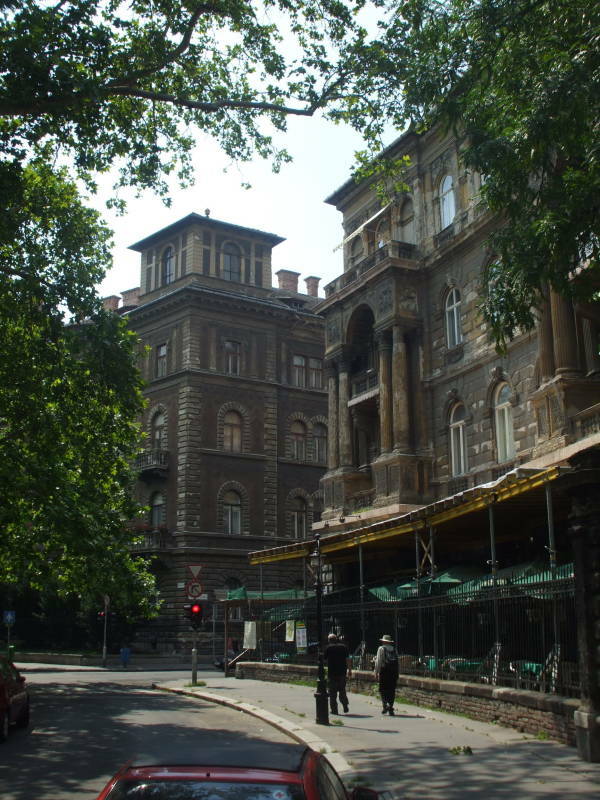 It was based in the twin capitals of Vienna and Buda, part of unified Budapest after 1870. This unified monarchy collapsed in the autumn of 1918 with the end of World War I. the Hungarian Democratic Republic was then proclaimed as an independent country, which then became the Kingdom of Hungary during 1920-1946. 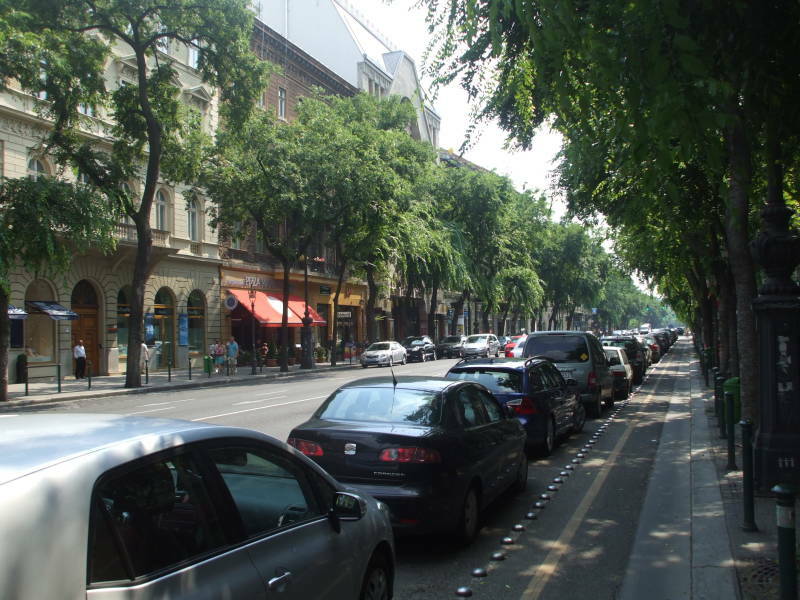 Andrássy út is one of the main boulevards in Budapest. It was originally built in 1872. 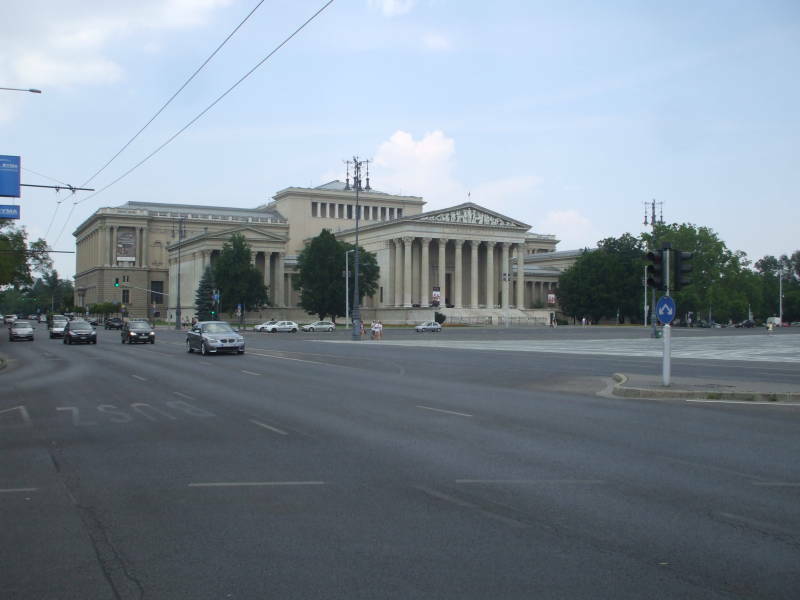 It was renamed three times during the 1950s due to the Communist rule of Hungary. 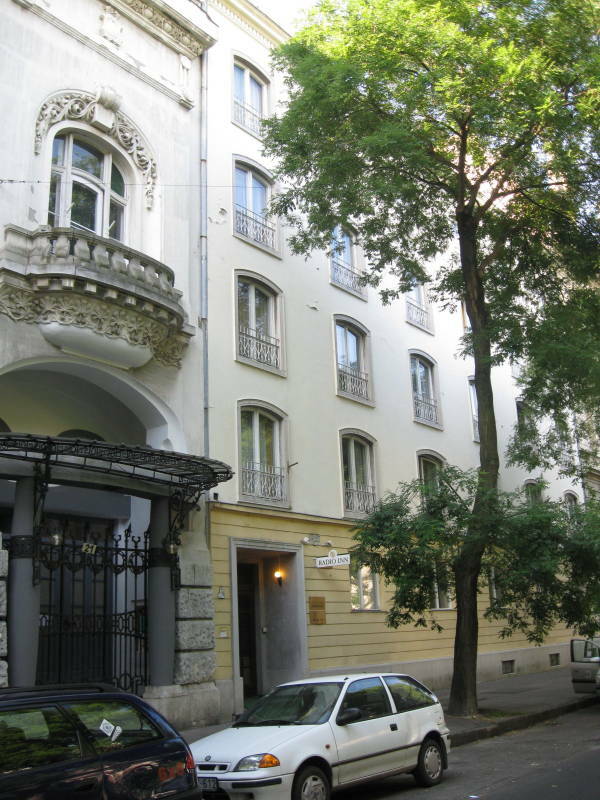 It was relabeled as Sztálin út (or "Stalin Street") in 1950, Magyar Ifjúság útja (or "Avenue of Hungarian Youth") in 1956, and Népköztársaság út (or "People's Republic Street") in 1957. 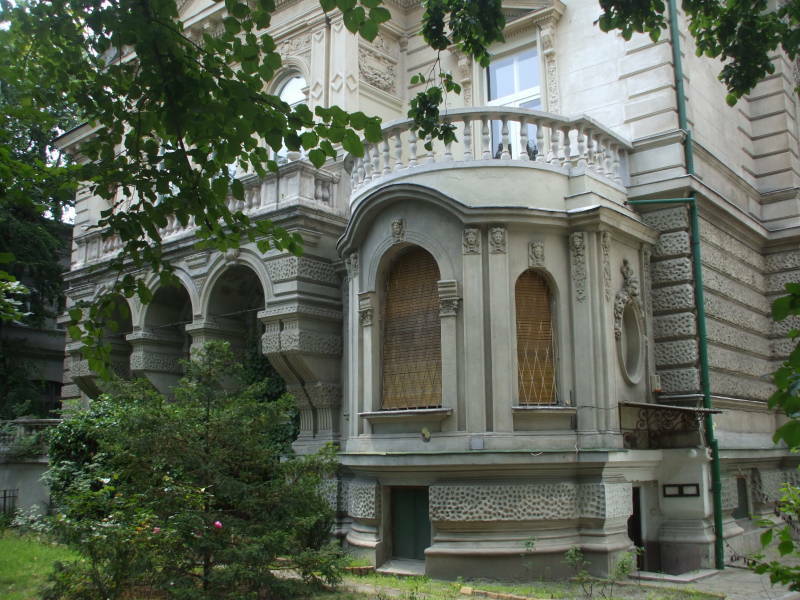 It was restored to its original name of Andrássy út in 1990, after the fall of Communism. Hősök tere, or Heroes' Square, is at the north-east end of Andrássy út. 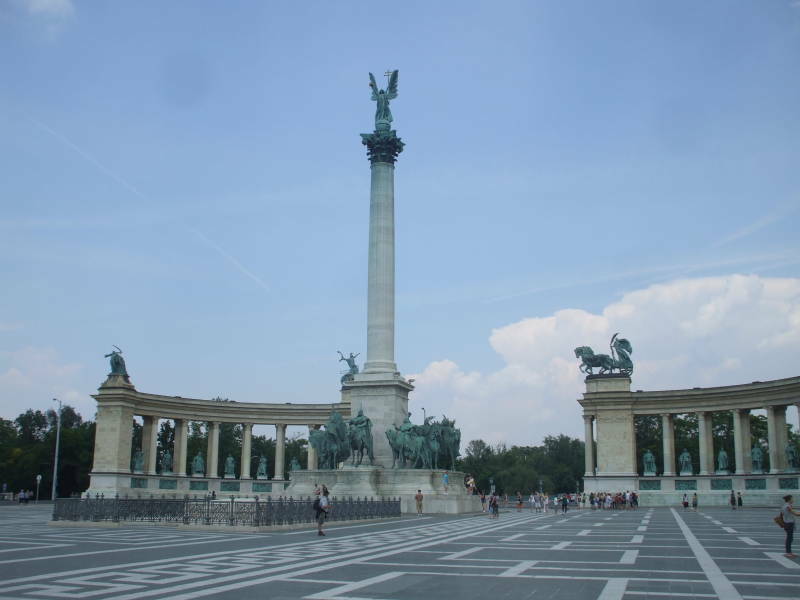 Ezeréves emlékmű, the Millenary Monument, has a 36-meter pillar topped with the Angel Gabriel holding the Hungarian crown and a cross. At the base are statues of Árpád and the six other Magyar chieftains who conquered and controlled the Carpathian Basin in the late 9th century. The columnades frame fourteen statues of rulers and statesmen, from King Stephen on the left to Lajos Kossuth on the right. Reliefs below the statues depict important scenes from that man's life. In the post-Communist years this has also become a memorial to the 2,500 Hungarians who were killed in the Hungarian Revolution of 1956, plus the 13,000 or so wounded and the 200,000 who fled as refugees. It was a spontaneous nation-wide revolt against the Soviet-imposed policies and the Communist government of the People's Republic of Hungary. It began as a student demonstration on 23 October 1956. They were fired upon by the Államvédelmi Hatóság or ÁVH, the State Protection Authority. The ÁVH was an external appendage of the Soviet Union's secret police forces with a reputation for brutality. News of the fighting spread quickly through the nation. Militias formed and began fighting the ÁVH and Soviet troops. The Soviet Poliburo initially announced that it was willing to negotiate a withdrawl of Soviet forces, but it then retracted this offer. A large Soviet military force moved into Budapest and other areas of Hungary. This was Operation Whirlwind, under the command of Marshal Ivan Konev. Five Soviet divisions already in Hungary were augmented to a total strength of seventeen divisions. The Soviet Army had completely encircled Budapest by 21:00 on 3 November. At 03:00 on 4 November, Soviet tanks rolled into Pest. Armored units moved into Buda soon after and fired their first shots at 04:25. Hungarian Prime Minister Imre Nagy broadcast his final plea at 05:20, telling the nation and the rest of the world that Soviet forces were attacking and the Hungarian government remained in office. That radio station was taken off the air at 08:07. Fighting continued until 10 November. 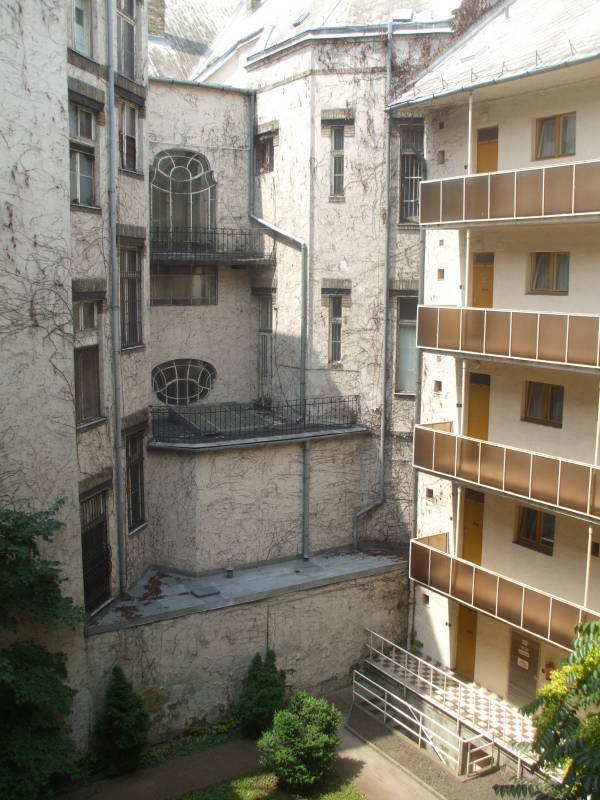 By that time the industrial areas of Budapest had been subjected to artillery and air strikes, and Soviet tanks had fired indiscriminately, making no distinction between military and civilian targets. The U.S. broadcaster Radio Free Europe had been urging the Hungarian people to fight the Soviets, offering tactical advice on resistance operations and, in the conclusion of many, misleading the Hungarian people into believing that NATO or the U.N. would intervene on their behalf if only they continued to resist. Meanwhile, the Suez Crisis was happening at the same time, from 29 October through 7 November. Egyptian President Gaman Abdel Nasser had nationalized the Suez Canal and closed it and the Straits of Tiran, at the mouth of the Gulf of Sinai, to Israeli shipping. Israel invaded Egypt, and the U.K. and France started bombing Cairo. The British and French forces withdrew by the end of the year, but Israel occupied the Sinai until Marth of the following year. Richard Nixon, U.S. Vice-President at the time, said "We couldn't on one hand, complain about the Soviets intervening in Hungary and, on the other hand, approve of the British and the French picking that particular time to intervene against Nasser." 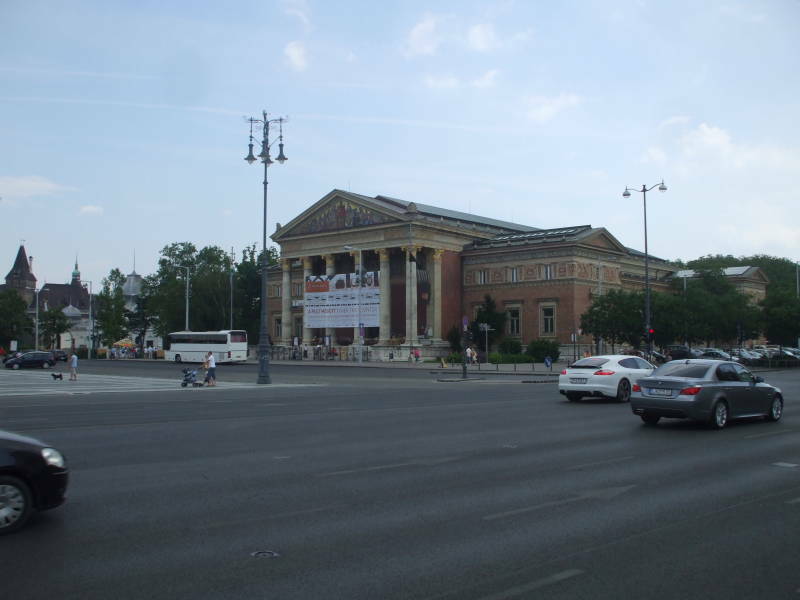 The Museum of Fine Arts is on one side of Heroes' Square. The Palace of Art is on the other side. 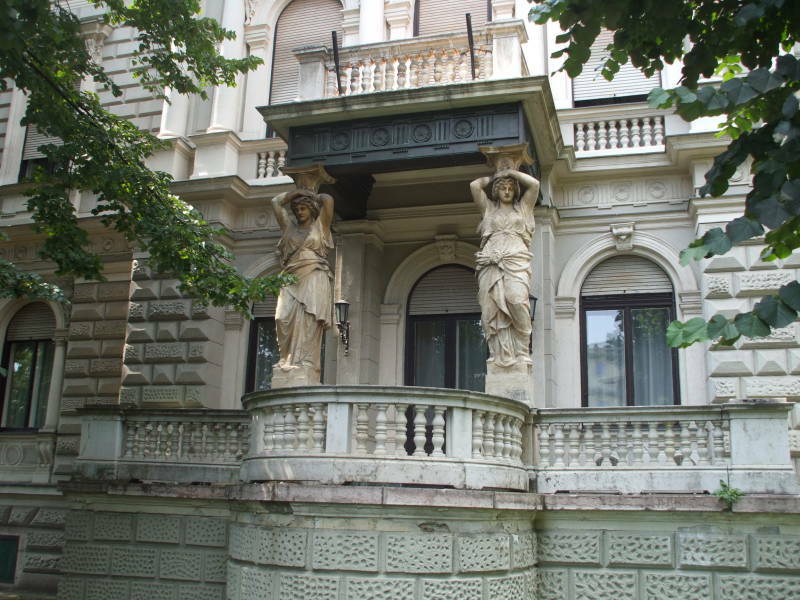 There is interesting architecture along Andrássy út. A number of nations have their embassies here. Kodály körönd is a large circle along Andrássy út. 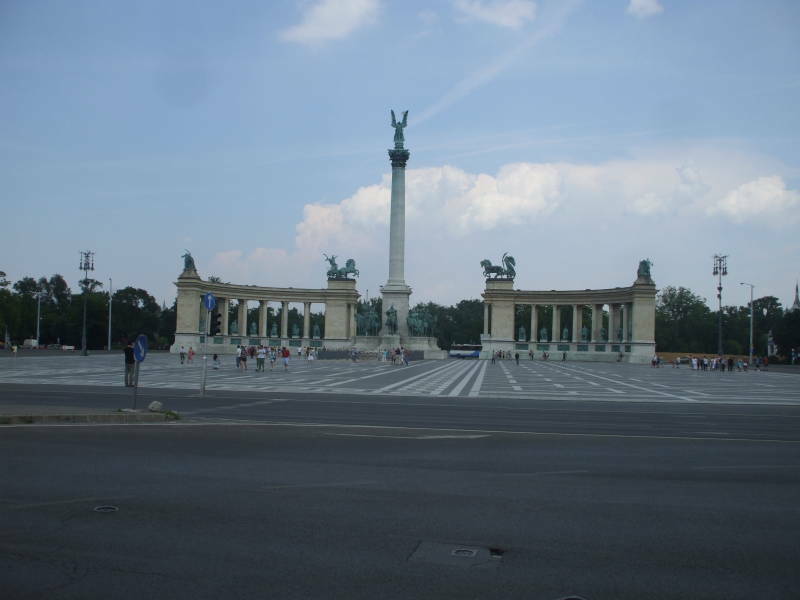 There are four statues of Hungarian heroes around the circle. 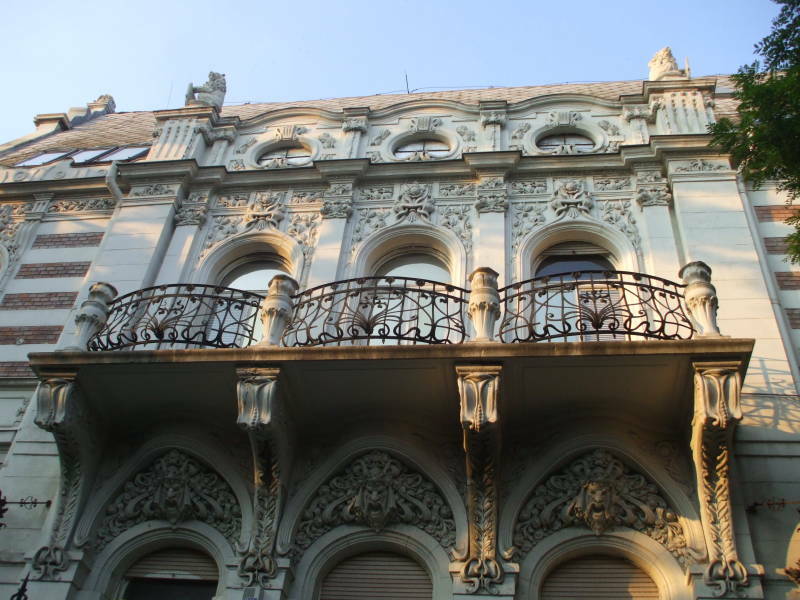 It is lined by elaborately decorated buildings. 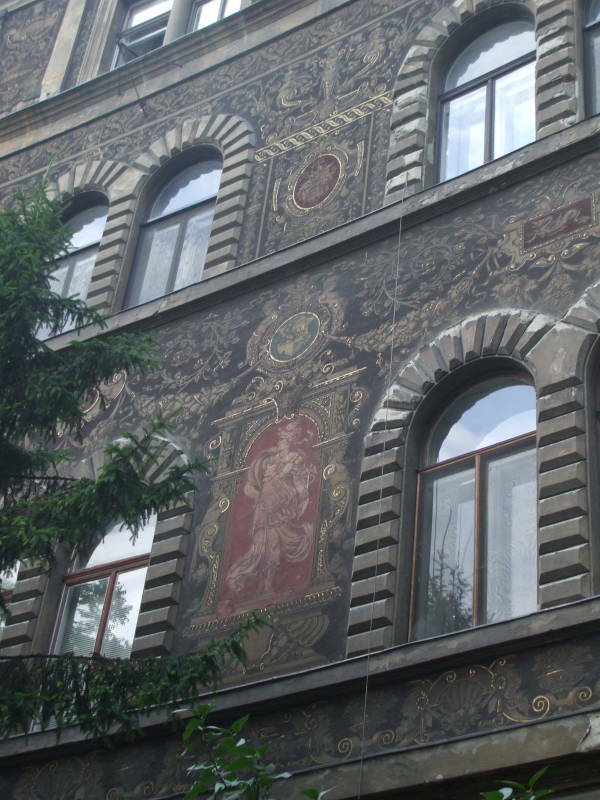 This building at Kodály körönd is decorated with the sgraffito technique. Andrássy út becomes even more prosperous south of the large intersection and eight-sided square of Oktogon. 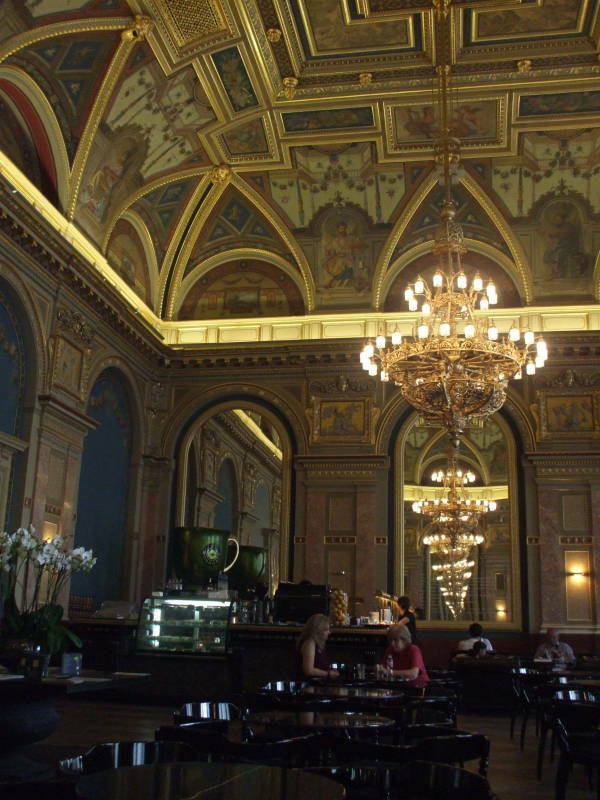 The Párisi Nagyaruház (or Grande Parisienne) was first opened in 1912. It was called the Fashion House. Its ground floor now has a book store and a wine shop. The mezzanine level is the elaborately decorated Diszterem or the Ceremonial Hall. 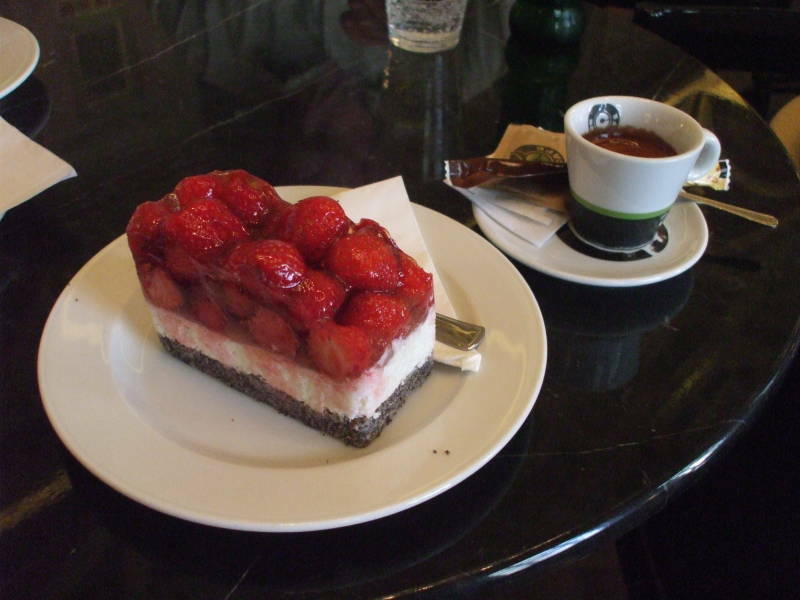 It is now a very nice coffee house where we had pastry and coffee. 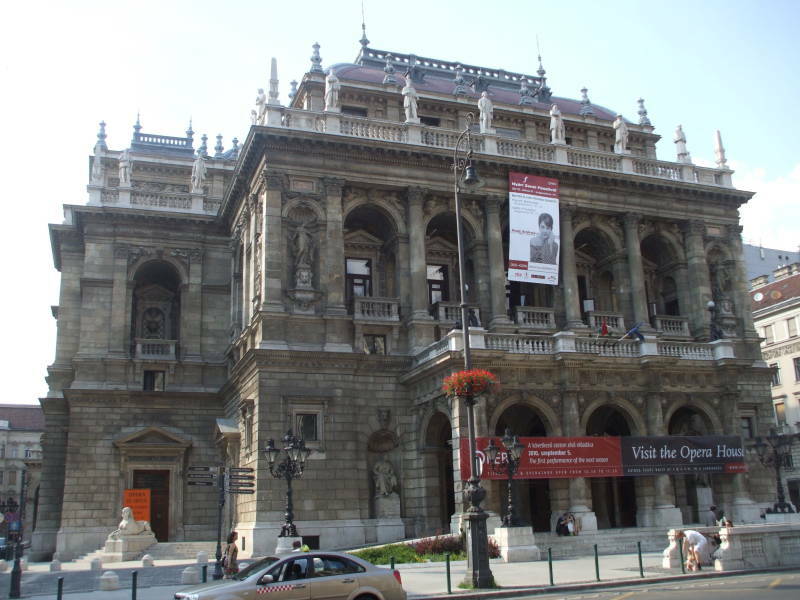 The Hungarian State Opera House is a little further south along Andrássy út. 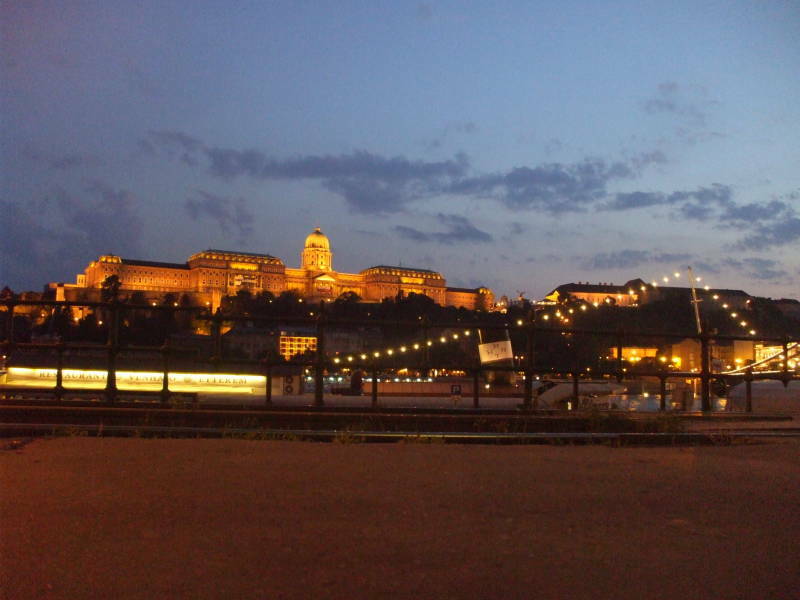 We are on the Pest side, looking across the Danube River and over the Chain Bridge to Castle Hill in Buda. My parents are standing at left, their friends who joined them for the Romania through Prague portion of the trip are to the right. 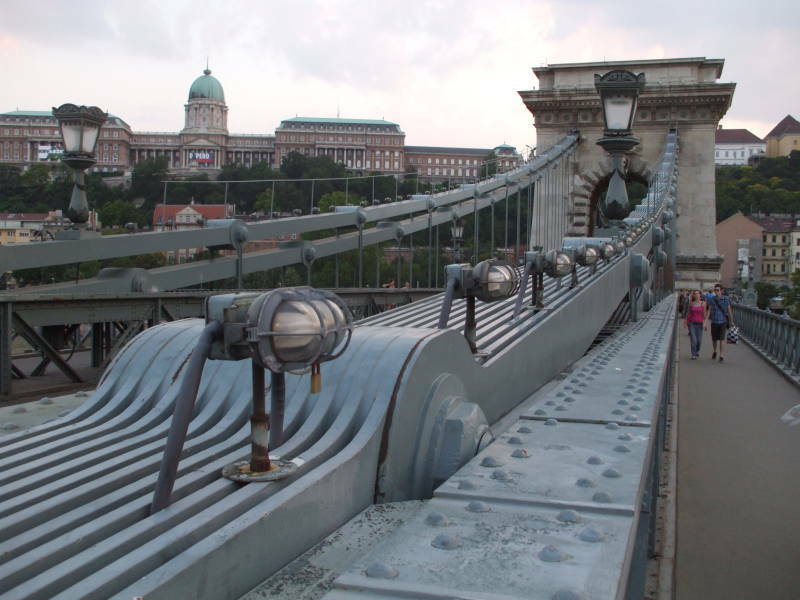 They're on the Chain Bridge, crossing from Pest to Buda. 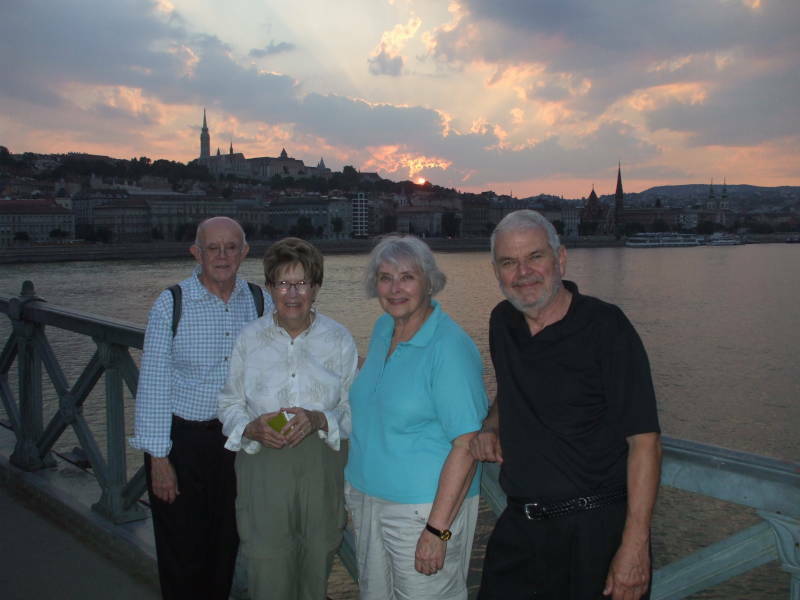 Bill, Betty, Shirley, and Larry on the Chain Bridge in Budapest. Why is it called the Chain Bridge? Because of its construction — it is a suspension bridge with the main suspension elements made of large-scale chain rather than stranded cable. 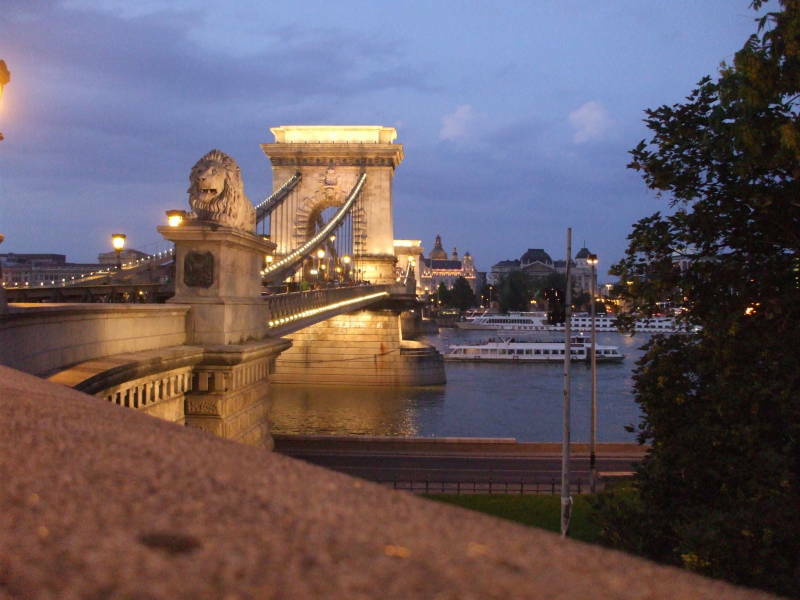 It is named for Count István Széchenyi, a major supporter of its construction, but its distinctive design makes it mostly known as the Chain (or Lánchíd in Magyar) Bridge. This was built in 1849 as the first permanent bridge across the Danube River. Its center span of 202 meters made it one of the longest bridges in the world at the time. It was designed by the English engineer William Tierney Clark as a larger version of his earlier Marlow Bridge across the River Thames in Marlow, England, west of London. The construction was supervised by the Scottish engineer Adam Clark, who was no known relation to the designer. The traffic circle at the Buda end of the bridge is Clark Adam tér, with the builder's name in the Hungarian order of family name first followed by given name. At the Buda end of the bridge you could climb the steps or ride the funicular railway up Castle Hill. 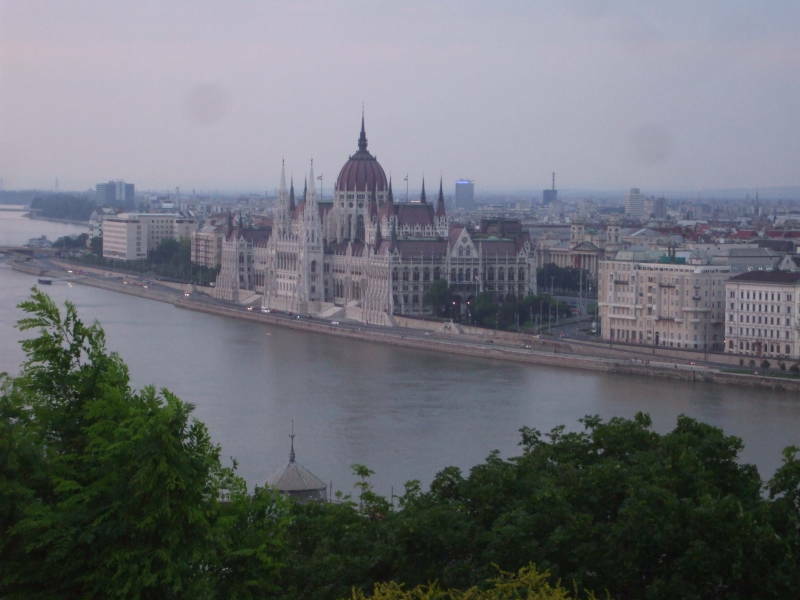 From there you have a nice view of the Hungarian Parliament building and other landmarks. Then it was back across to the Pest side for dinner. Maybe some gulyás, which we would spell "goulash"? It was an interesting place. 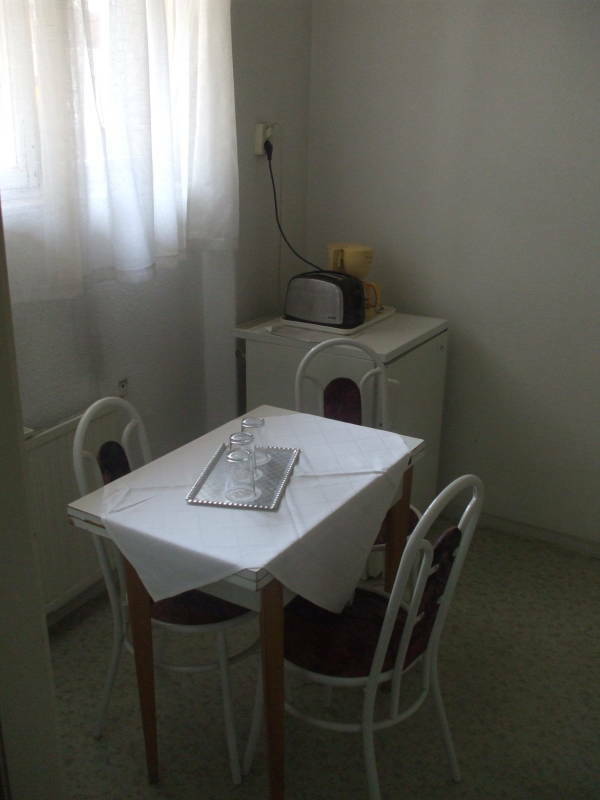 It is still owned and operated by the national broadcasting organization, and it is designed as apartments for extended stays. We were just there for a short time, but it would be a nice place to stay for a while. 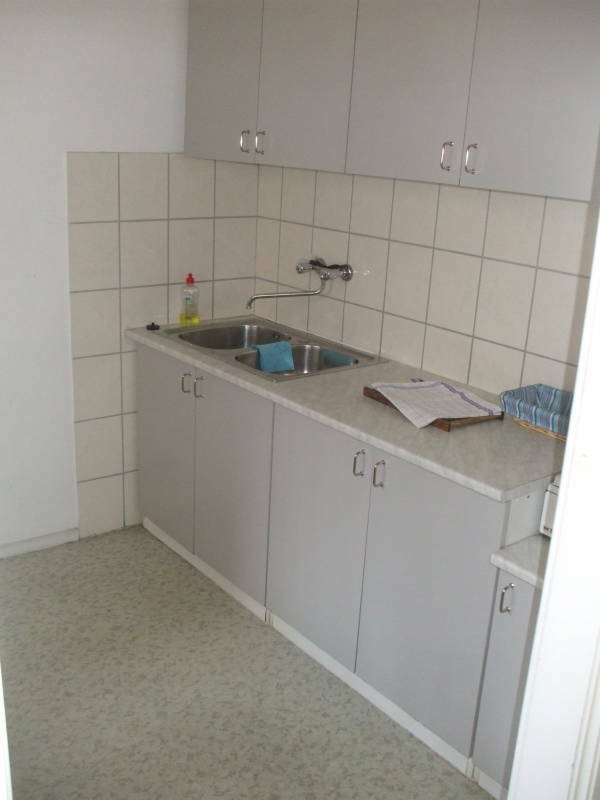 And, it was quite reasonably priced for a hotel room in a large city, extremely so for a complete apartment! I was intrigued to spot this two-band HF dipole antenna above the courtyard. It has multi-wire conductors for increased bandwidth on each band. It looked like it might be for the 20m and 30m amateur bands. Below it you can see what might have been a single-wire dipole for the 40m band. 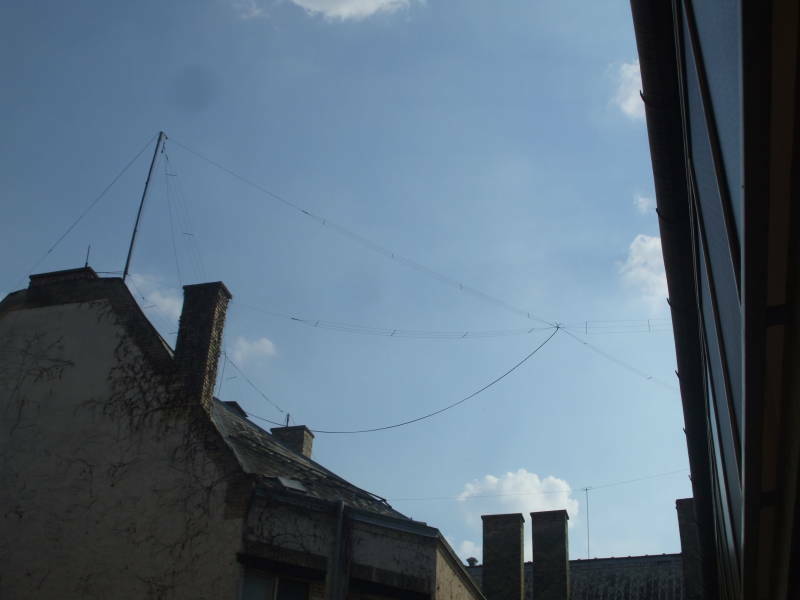 However, these antennas were above the adjacent building and were not connected to the Radio Inn itself. They might have belonged to a nearby embassy or consulate.